Renew Crew helps community members reuse and recycle clothing, textiles, and small household goods. Serving Kelowna, Kamloops, Penticton, Vernon and surrounding communities. As a business of Big Brothers Big Sisters Central and Southern Interior of BC, we collect donated goods and resell them in the thrift retail market and recycling market. The proceeds from this social enterprise fund our school-based programs that help more than 3,000 children. The Renew Crew is one of the most successful social ventures, generating funds for our vital social services. We collect donations through a combination of home pick-ups, on-site clothing bins for drop-offs, and targeted community clothing drives. Thanks to donors like you, last year we collected over 3.5 million pounds of clothing and household and generated over $200,000 in net profits for our vital social services. With over 75% of our revenue from our partnership with Value Village, it’s important to continually collect used clothing from within our community. Below is a list of donations we accept in bags or boxes, as well as items we do not accept. Sports equipment: skis, snowboards, skates, etc. Donations MUST be suitable for resale and in full working order. Donations CANNOT be soiled, dangerous materials or a potential safety hazard. Every time you donate a bag of clothing, we are able to mentor more children through our school-based program in our communities. The revenue generated from our used clothing program is crucial to Big Brothers Big Sisters of Central and Southern Interior of BC. We use the funds to recruit, screen, train, and support volunteers, staff, as well as further develop our programs to meet changing community needs. Recycling – We are one of the largest recyclers of used goods in the community. In 2018, we diverted over 3.5 million pounds of clothing and housewares from landfills! Local Jobs – The gross revenues of our enterprise employ dozens of people throughout Central and Southern Interior of BC. Buying Options – Thrift retail stores offer families affordable and unique goods! School-Based Programs – We offer social learning programs in the classroom, to students aged K-7 that increase empathy, self-awareness and self-regulation. Tk’Emlups Petro Canada – 301 Yellowhead Hwy. A clothing drive within your organization where employees compete to bring in the largest amount of clothing. The employee that collects and donates the most used clothing wins a prize provided by Big Brothers Big Sisters. A clothing drive to fundraise for your school, church or any other community groups. We provide a 16’ cargo trailer at your site. Prior to the drop off of the trailer, we will provide you with bags and postcards to hand out. Typically, we will leave the trailer on site for 1 -2 weeks to fill. 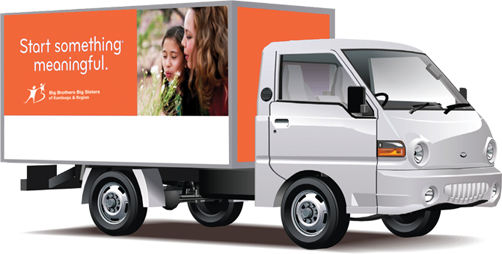 After the allotted period, if the trailer is full Big Brother Big Sisters will compensate you for the donated items. We then collect and convert your used clothing into dollars that are used to support youth mentoring programs.